One should guard against preaching to the young man success in the customary sense as the aim in life. ... The most important motive for work in school and in life is pleasure in work, pleasure in its result, and the knowledge of the value of the result to the community. 'On Education', address at the State University of New York, Albany (15 Oct 1936) in celebration of the Tercentenary of Higher Education in America, translation prepared by Lina Arronet. In Albert Einstein, The Einstein Reader (2006), 30. Nature is Christian; preaches to Mankind. The Complaint: or, Night-Thoughts on Life, Death, and Immortality (1742, 1750), Night 4, 78. 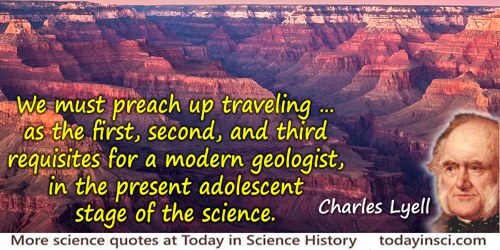 We must preach up traveling … as the first, second, and third requisites for a modern geologist, in the present adolescent stage of the science. Letter (12 Jan 1829) to Roderick Murchison, collected in Katherine Murray Lyell (ed. ), Life, Letters and Journals of Sir Charles Lyell, Bart. (1881), Vol. 1, 233-234.